An immensely rare Class I 1804-dated silver dollar, one of eight to exist, will go under the hammer during Heritage’s Platinum Night event on Aug. 9. It is the centerpiece of the company’s Aug. 8-10 U.S. Coins Signature® Auction in Rosemont, IL. This same silver dollar in April 2008 went for $3,737,500 to a collector from Greensboro, N.C. The anonymous seller is ready to part from it and other rarities in part four of a series of sales by Heritage dubbed The Greensboro Collection. No American coin has a more storied and famous history as the Class I 1804 Silver Dollar, Heritage notes. "The Class I 1804 $1 is the undisputed King of American coins. It is always an event when one of them shows up for auction," said Greg Rohan, President of Heritage Auctions. "It’s the rare chance for a top collector to add their name, or the name of their collection, to a history that will never diminish in importance." United States Mint records from 1804 show that 19,570 silver dollars were produced, but it is commonly believed that these examples were all leftovers bearing 1803 dates. Though dated 1804, Class I 1804 silver dollars were not minted until about 1834 when ordered in proof quality by the State Department to include in special diplomatic sets. 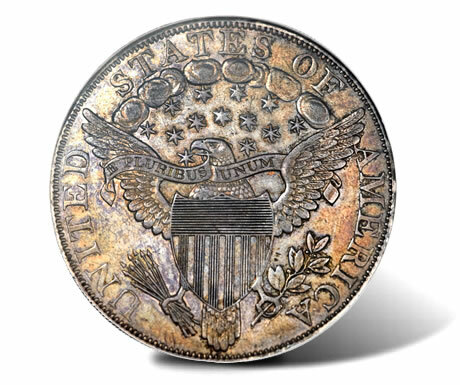 "In all of numismatics of the entire world, there is not today and there never has been a single coin which was and is the subject of so much romance, interest, comment, and upon which so much has been written and so much talked about and discussed as the United States silver dollar of 1804," B. Max Mehl, in the Dunham Collection catalog of 1941, quoted in the preface of The Fantastic 1804 Dollar. 1804 silver dollars are broken up into three classes. Class I coins are referred to as originals with eight existing. Class II and Class III 1804 silver dollars are known as first and second restrikes with production time frames of between 1858 and 1860. 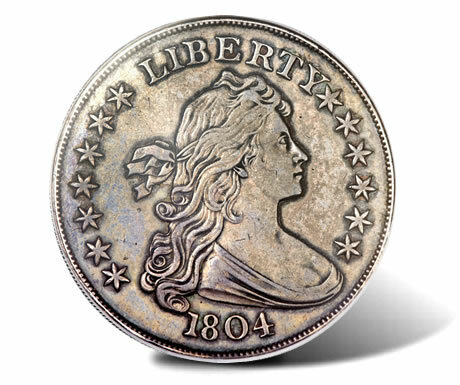 Early bidding has the Mickley-Hawn-Queller Class I 1804 Silver Dollar at $2.1 million. Its current Mickley-Hawn-Queller naming notes three past owners, prominent numismatists Joseph J. Mickley, Reed Hawn and David Queller. For auction details and more about the 1804 $1 graded by PCGS as Proof 62, see this Heritage page.